After many delays, AIDA Cruises’ new 3,268-berth AIDAprima arrived at her new home port of Hamburg on Thursday, the first of about a dozen ships now on order to feature a new design of vertical bow that will change the appearance of cruising. 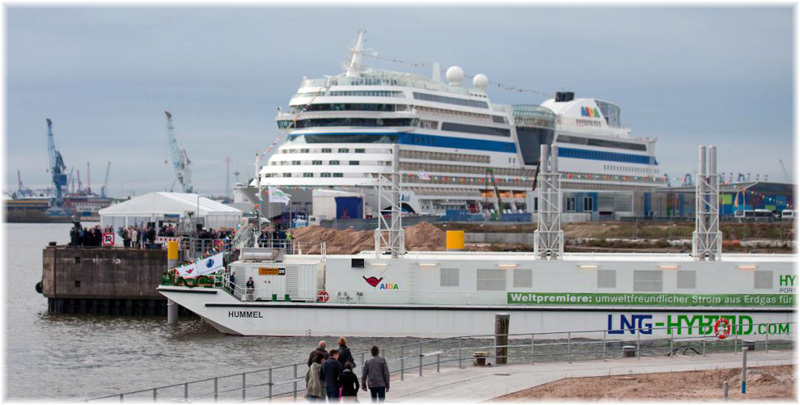 The arrival of AIDA Cruises’ new AIDAprima into Hamburg last week served to introduce a new concept to the world of cruising – a return to the straight bow that was popular a century ago. With sister ship AIDAperla and four similar 5,000-berth ships of larger dimensions now on order for AIDA and parent company Costa Cruises, AIDAprima marks the first of half a dozen ships to be delivered to the group over the next few years. Also last week, Hurtigruten ordered two ships of a smaller but similar design. These 600-berth ships will be equipped for adventure cruising worldwide. Add to these the recent order by Crystal Cruises for its 200-berth polar ship Crystal Endeavour and we are up to eleven ships with this new bow design, all combining some element of cold weather and LNG-fuelling capabilites as well. The new vertical bow is said to be more efficient and provide sea-keeping abilities that are equal to or greater than the traditional flared bow. It is also said to cause less stress and strainon the vessel as it slices through heavy seas instead of trying to part them as the usual flared bow does. Meanwhile, others say that the absence of the flare on the bow can make the forward decks quite wet in a seaway, depending on the prevailing direction of the winds. 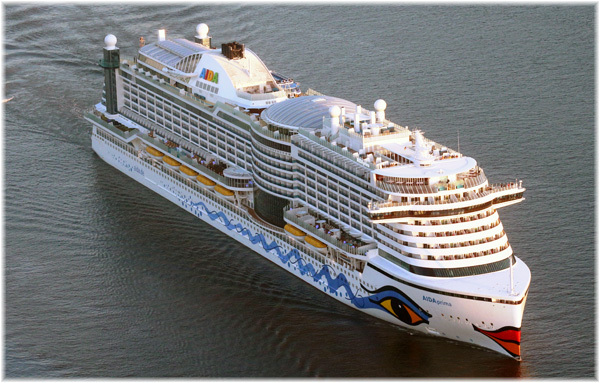 Built by Mitsubishi Heavy Industries in Nagasaki, AIDAprima is also the first AIDA vessel to be designed to operate year-round from Germany. Four more similar-looking ships, but with more than 5,000 lower berths, are on order at Meyer Werft shipyards in Germany and Finland for the same Costa Group owners, two for AIDA Cruises at Papenburg and two for Costa Cruises at Turku. This Saturday, AIDAprima will commence regular 7-night cruises from Hamburg’s new Steinwerder cruise terminal serving the Western European capitals of London (via Southampton, Paris (by Le Havre), Brussels (by Zeebrugge) and Amsterdam (from Rotterdam). Last Tuesday, on the occasion of AIDAprima’s first docking at Rotterdam, AIDA Cruises and Shell signed a partnership deal for the future supply of LNG to AIDAprima and sister ship AIDAperla. AIDAprima is the world’s first cruise ship that can be operated in port with liquefied natural gas, leading to a major reduction in emissions when docked. In all the ports along her European Capitals route, AIDAprima’s sytems will be powered by LNG while docked. In contrast to traditional marine diesel containing 0.1% sulphur, emissions are significantly reduced when using LNG. Sulphur oxide and soots will be completely eliminated while nitrogen oxide emissions will be reduced by up to 80% and carbon dioxide emissions by 20%. AIDAprima leaves Hamburg today on a short 4-night demonstration cruise to Southampton, returning to her home port on Friday. She will be christened on May 7 by German actress Emma Schweiger as part of the Port of Hamburg’s 827th anniversary celebrations. Meanwhile, Norway’s famed coastal shipping line Hurtigruten announced a major fleet renewal and expansion program last Thursday, with an order for up to four new 600-berth ships at a shipyard that is actually located on the route it serves. The weaker kroner and ever-growing interest in northern Norway and the country’s spectacular scenery have led to high occupancy rates on Hurtigruten ships, something that has recently been the case even in the winter. The shipping line therefore feels it now needs more capacity. Hurtigruten has thus ordered two new explorer ships, which have been designed by Rolls-Royce in conjunction with Norwegian ship designer Espen Øino and built by longstanding partner Kleven Verft at Ulsteinvik. Marking the largest investment Hurtigruten has made in its 120-year history and the first newbuilding order in more than a decade, the new contract covers two vessels with an option for two more. The first two will debut in 2018-2019. The new ships will be designed to operate in the Arctic and Antarctic regions as well as along the Norwegian coast. Like the new AIDA ships, they will be equipped with advanced environmentally friendly technology to reduce emissions and allow Hurtigruten to meet its sustainability goals. The order is worth several billion kroner and a lifesaver for the Kleven shipyard. “This is economic restructuring in practice, from the oil and gas industry to other maritime sectors,” said the yard’s chief executive, Ståle Rasmussen. In an interview, Daniel Skjeldam, chief executive of Hurtigruten, stressed that he wanted to expand the fleet with new 300 to 600-berth ships, able to attract customers who might not normally consider a cruise, in line with the firm’s more recent focus on adventure. Hurtigruten has already announced new itineraries in the Amazon and eastern Canada and Labrador, starting in 2017, and is eyeing Alaska alongside other potential summer destinations. Hurtigruten also plans to refurbish four of its existing vessels that serve the thirty-four ports along the Norwegian coast between Bergen and Kirkenes. Although Hurtigruten underwent a major fleet update in the 1990s, it’s been ten years since its last vessel, the 254-berth Fram, was ordered for Arctic waters. More recently, it has acquired the 320-berth Spitsbergen, a conversion from a newly-built Spanish passenger vessel. Going even further than the Hurtigruten ships, Crystal Cruises recently ordered a 200-berth Polar Class 6 expedition ship to be named Crystal Endeavour. To be built by Lloyd Werft in Bremerhaven, she will be named for Captain Cook’s HMS Endeavor and delivery is scheduled for August 2018. With four ships for AIDA, two for Costa and four more for Hurtgruten, plus the Crystal Endeavour, it will not be long before the number of these bluff-bowed ships will exceed a dozen. 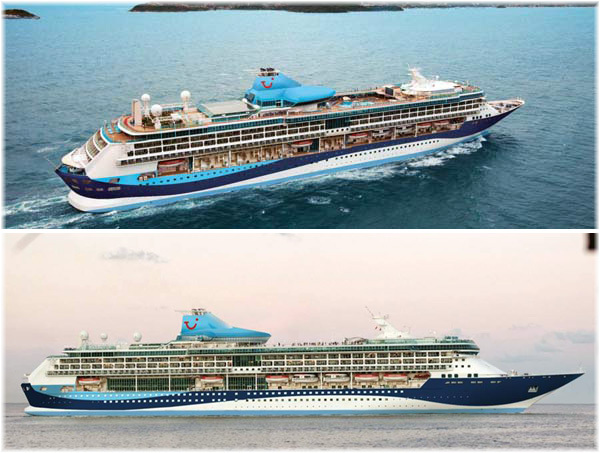 It was announced last week that when Royal Caribbean International’s 1,804-berth Splendour of the Seas joins the UK-based Thomson Cruises fleet, she will now be named TUI Discovery instead of the originally-intended Thomson Discovery. Meanwhile, TUI Cruises’ first two Mein Schiff vessels, which were acquired from Celebrity Cruises, will also take TUI names when they join Thomson Cruises, while the existing fleet will retain their Thomson names. The TUI-named ships will have the advantage of offering many more veranda cabins, as well as other amenities. They will also identify ships that are owned by TUI rather than chartered, which is the case with most of the fleet today. TUI has previously stated that it wants to move into operatng owned ships in future. “The introduction of TUI Discovery marks a new era for our cruise business in the UK which will continue with the introduction of two more TUI ships to the fleet over the next three years,” said Nick Longman, managing director of TUI UK & Ireland. TUI Cruises in Germany is 50:50 owned by TUI itself and Royal Caribbean Cruises. 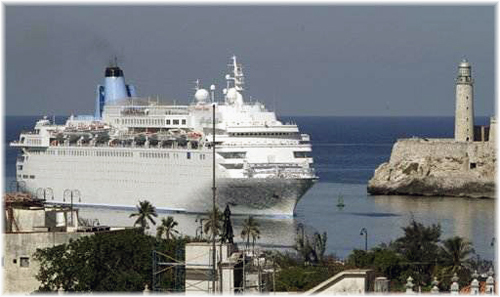 The UK cruise operation of TUI is called Thomson Cruises and it is owned by TUI on its own. But joint venture TUI Cruises will own and manage TUI Discovery, while Thomson Cruises will be in charge of her commercial operation. Thomson Cruises operates five ships, most of which are second-generation ships from the 1980s that feature very few balcony cabins..
Rolls-Royce Marine, designer of the new Hurtigruten ships, is mainly a Norwegian operation, based primarily in Ålesund. Today’s operation is based primarily on the 1999 takeover by Vickers of the old Ulstein Group and Rolls-Royce’s acquisition of Vickers later that same year to form its commercial marine division. 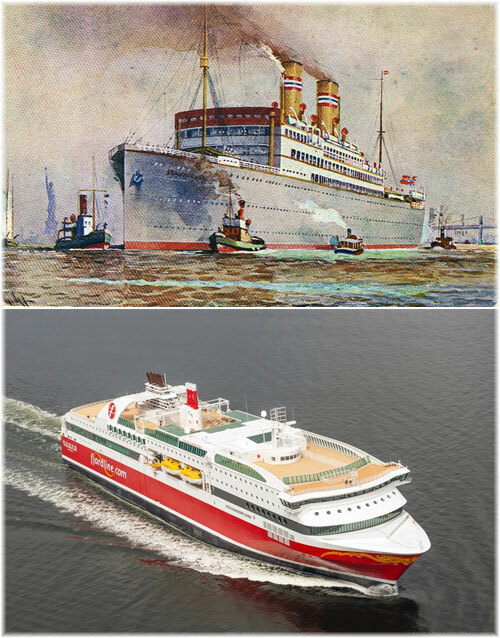 From ship design to propulsion and deck machinery, Rolls-Royce Marine provides solutions to many of the world’s leading cruise and ferry operations and has worked with night boat operators such as Stena Line and Minoan Lines, to name just two. The world’s first LNG-powered cruise ferry, Fjord Line’s 1,180-berth Stavangerfjord, delivered in 2013, is also equipped with four Rolls-Royce Bergen engines. Up until now, most of Rolls-Royce’s marine effort has involved the offshore industry and working merchant ships, as well as naval vessels, so this new design involvement with passenger ships is a significant expansion of their activities. Rolls-Royce has also worked in the very recent past with Kleven Verft, the shipyard that submitted the winning bid out of a dozen proposals. Seventy of the world’s maritime forces and over 30,000 commercial vessels use some form of Rolls-Royce equipment. And Rolls-Royce has also designed about 130 vessels of the NVC design for the offshore fishing industry.